Crystal Water and Herb Water: Miracle or Myth? Crystal water and herb water have been around for a long time, but you may not have heard of them. Since they’re making a resurgence into popular culture, I thought I’d write a bit about them. Basically, crystal water is a product created by placing a crystal in or near a container of water, allowing the vibration of the stone to become infused into the water. This water may then be diluted into very large quantities. The belief is that the vibrational qualities of the gemstone are fused with the water. Supposedly, when you add the distilled drops to water and drink the water, you’re filling your body with the vibrational qualities of the stone that was used in its production. A crystal water product may contain the vibrations of one or more gemstones. Unfortunately, the vast majority of these products have few or no active ingredients. Scientifically speaking, there is nothing measurable in the water at all. These products are typically diluted to the point where even the herbal fusions have no trace of the original ingredient present. In the vast majority of cases, there is no way at all to prove that you’re getting anything more than plain water. Sometimes the water has salt or glycerin added, but nothing with any measurable value. Many products of this type are marketed as “homeopathic cures” and are highly suspect. Generally, they operate on the placebo effect, and offer no real value to the user, often at a high price. Others claim to be miracle cures, and testimonials are often suspicious at best. When it comes to herbs, there’s a wealth of research showing how herbs can help us heal. Since the beginning of time, plants have been used medicinally, even before we understood what medicine was. It’s fairly easy to find reliable research on the properties of herbs and how to use them. As for herbs in water? Well, herbal teas have been used for centuries to good effect. We know that herbs can do great things for us, and they’re used widely across the world. As for other uses, like love or happiness, there’s no real proof, but a great deal of belief that herbs can have emotional and spiritual effects as well as medicinal ones. Crystals and gems are a bit different. There’s very little proof that they have any effect on us at all. 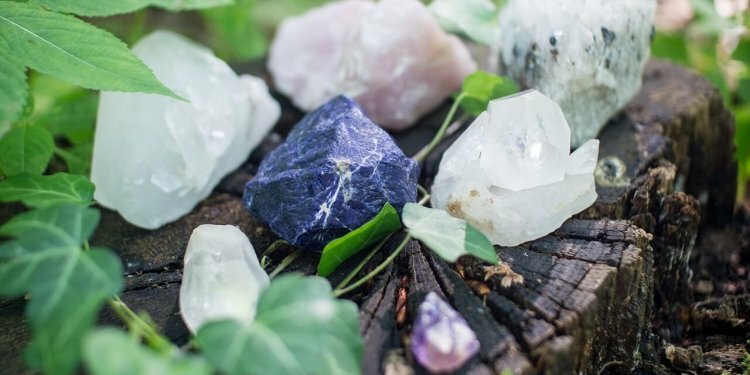 The belief in the power of crystals is largely a metaphysical issue rather than a scientific one. When it comes to crystal water and herb water products however, I have no faith in them at all. I believe that most, if not all of these products are scams targeted at desperate people. I don’t think there’s anything in them that can help people at all. From everything I’ve researched, not one of the products I’ve seen has any real ingredients, and the companies are illusive as hell about their practices. I wouldn’t buy these products, and I would never recommend them to anyone. Okay, so you believe in the power of herbs and crystals, and you love the idea of these drops. I’m going to give you a big tip right here… Make your own! Seriously, you’re far better off putting a pinch of basil or a shard of amethyst into a gallon of your own water, letting it sit for a while, and drinking that, than you are buying some mass-produced product. You can control the quantity, quality, and you’ll save a hell of a lot of money. There are plenty of books and online sources for information on the qualities of crystals and stones. Do a little research, and go buy some gemstone chips that suit your needs. As for herbs, again, there are loads of resources to draw from. Make some herbal tea or a distillation of your choice and drink that. Just be careful with herbs that may have side effects or be poisonous. Natural doesn’t always mean safe, after all. Let’s say you want to have some tourmaline water. (tourmaline is good for balance and confidence) I can find tourmaline chips for $4.99 (15″ strand), and a 6-pack of dropper bottles for $5.50 on Amazon. Water is free, or what, $1.50 a gallon for filtered? That’s $11.99 plus shipping. Most of these drops cost at least $25 per ounce. You just bought enough to make 128 ounces of crystal water at a cost of probably $0.14 an ounce. An herbal preparation costs a similar amount. In the end, I think you’re better off making your own crystal water or herb water if it’s something you want to use. Making it yourself ensures that you’re getting what you pay for. Whether it works because of science or faith, this kind of product is probably better made at home than bought from some company that may not have your best interests in mind.